My plan is to leave Granada tomorrow - I say plan because I am quickly learning that you have to be more than flexible out here!! Granada has been great - it is a really beautiful colonial town set on the north of the massive Nicaraguan Lake (I think 5th largest in the world or something like that!) There are lots of pretty buildings everywhere and a main street where all the restuarants and bars are located. At the bottom of the road is the lake. I am hoping to take the boat from here to San Carlos - the bottom right hand side of the lake. Not many people make this journey as it takes 17 hours and you can hardly call the boats luxurious...not feeling so spoilt now! The road route is almost impossible because the road has not been completed and so the journey is supposed to be even more uncomfortable than the boat and only goes twice a week. Once in San Carlos you can venture into the swamp/jungle area which is a little off the beaten track and supposed to be worth the journey according to the other travellers that I have spoken to and my new friends last night! The good news is that the border crossing to Costa Rica is much easier to cross - mainly because no one uses it! The last week has been really good. We arrived in Granada on Wednesday and spent a very lazy Thursday just relaxing in the town, eating nice food and then had a hot stones massage - pure bliss! 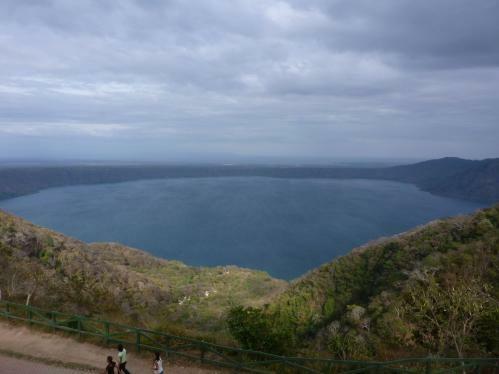 Yesterday, we went to Laguna de Apoyo which was amazing. It is a old crater which is very beautiful and with warm water just perfect for swimming in. The weather was really good - hot and sunny with not a cloud to be seen - I was so pleased as it was Lou's last day so wanted it to be a good one! We both got a little burnt but had a great time. The scenery was amazing (again). In fact today I went out on the chicken bus (so much more fun than the safe and quick taxi's) to a little village called Caterina which has stunning views over the lake. You can see how close it is to Granada, two other volcanos and the rim of where the original volcano used to be! Really worth visiting! Heading home wasn't so easy. I waited at the bus stop with all the other locals then about half an hour later the bus came but we were unable to get on for some reason. One of the ladies explained there were no more buses as it was Sunday and that we all had to go to another bus stop and catch a bus in the opposite direction to get another one back....all in Spanish so I was more than a little confused. Half an hour later no buses were coming so I decided to hop into a tuk tuk - great fun, although nearly crashed because he kept turning his head round to talk to me and wasn't watching the road!!! Also all in Spanish so God knows what I was saying yes to! !